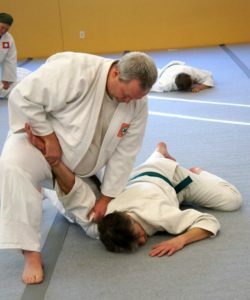 Many Aikido movements involve kneeling or sliding on the mat. As such, we recommend wearing clothes that cover knees and elbows and do not restrict movement. Sweat pants or yoga pants and long-sleeve knit shirts are excellent choices for training. Jeans or pants with lots of buttons or zippers are not recommended. We also ask that you not wear clothing that could stain the mat. Socks are not needed, as we train barefoot. You may wear socks if removing them would make you uncomfortable, but be aware that the canvas mat may be slippery. Though not required for beginners, a martial arts uniform (called a dogi) may also be worn. We use judo uniforms that have thicker padding, although any white or off-white uniform with a white belt may be worn. If you continue with Aikido training, you will eventually want to acquire a uniform. Dogi are available for purchase at local martial arts supply stores or online – talk to an instructor if you are interested. Please remove watches and jewelry, and make sure any pockets are empty before class. If you wear glasses, you may find a sports band helpful. You are welcome to change into training clothes at the Waterbury building. While we do not have changing rooms in the dojo, there are nearby restrooms in the building with plenty of room for changing. The most important aspect of Aikido training is safety. 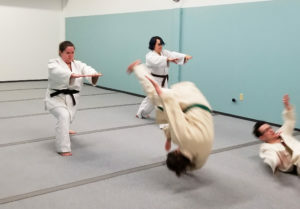 The techniques are designed to be as safe as possible, but classes can be physically demanding. Ultimately, you are the best judge of your physical state. We encourage you to push your limits in our classes, but if you feel ill or otherwise unable to continue, please feel free to sit out until you feel ready to rejoin the class. (Please alert the instructor if you need to sit out so they know whether you require assistance.) If you have an injury that makes certain movements painful or impossible, please let the instructor and your partner know so you can avoid injury. Likewise, pay attention to your partner and loosen pressure if they indicate that a grip or control has become painful. The mat can become crowded during class so all students must pay attention to their surroundings. Only perform throws or pins if you are sure that your partner can land safely. If there is an obstruction, either end the technique or adjust your position so that the technique can proceed safely. When practicing breakfalls, make sure that you will not run into others or end up falling off the mat. By remaining aware of our surroundings, of our partners, and our own bodies, we can continue to enjoy injury-free Aikido training.